Pansy Printed Tee is rated 4.8 out of 5 by 69. 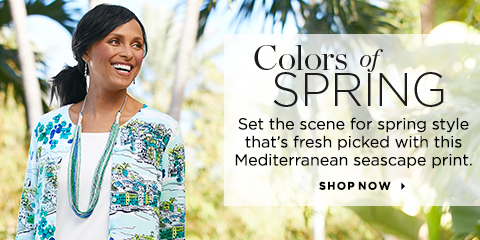 Featuring a mix of pansy and chevron prints, this tee puts a fresh spin on an everyday style. Rated 5 out of 5 by jackie44 from Definitely an exposion of color and beauty! I was asked to model at C&B and could pick any styles I wanted. I just fell in love with this beautiful top with it's lovely spring flowers in an array of brightly colored flowers and butterflies. The choice of bottoms to coordinate was unlimited and C&B had all those colors of bottoms to go with it. I chose a dark purple pair of crop pants to go with it and wowed the audience with my stunning choice. This top is so versatile. You can wear bottoms in purple, lavender, dark blue, light blue, gold, black, white, sage green and even a pair of blue denim jeans. Thanks, Christopher and banks! Rated 5 out of 5 by MaryED61 from My husband loves this. I was shopping for pants and he picked this up as a match to the pants I was trying on. It fit perfectly and washes up so nicely. Rated 5 out of 5 by Mom Z from Perfect blue jean tee shirt! This goes perfect with blue jeans and the fushia tie back sweater! I get compliments every time I wear it. Fit is true to size. Rated 5 out of 5 by EdieEm from Lovely Flowers! My husband picked out this top as a birthday gift for his sister. He brought it home for my approval, and I loved it. His dear sister loves pansies, and always gifts us a large pot for our front porch in the Spring. Naturally, as soon as he saw the tee, he thought of her. As for myself, while also a lover of pansies, I adore the colors purple and lavender. His sister was very happy with her gift, exclaiming over the colors and the flowers. We know she is going to love wearing the pansy tee, and it will look lovely on her. All in all, a very successful birthday gift. Rated 5 out of 5 by Jean98 from Pretty top Pansies are my favorite flowers. This top was calling my name! Rated 5 out of 5 by Animalover from Nice for a cruise I received this pretty top in a timely manner, with plenty of time to plan my accessories. I ordered some lovely pansy jewelry to compliment it, and am waiting for them to arrive soon. This top lifts my spirits, and I plan to wear it with a pair of purple jeans. It will also be dynamite with yellow, white, or as the pic shows, blue pants. I like the material as well. What a gem! Rated 5 out of 5 by kris49 from Gorgeous! I haven't had an opportunity to wear this shirt yet--it's still winter where I live--but I love the color and the way it fits. Can't wait to show it off! Rated 5 out of 5 by joan72 from Vibrant colors. I am 5 feet tall, weigh 147 pounds, and I'm pear shaped. I like my tops slightly loose around the hips. I also like them to slightly cover my upper thighs. This fits well. I have received many compliments on this top. I ordered a size large in misses. I find that I get a longer fit and the 3/4 length sleeves fit well.